Corrosion Monitoring generally makes use of installed probes. These can either be reference electrodes for half-cell potentials at set positions, corrosion rate probes using active measurement techniques such as either galvanostatic pulse or linear polarisation methods or that measure corrosion rate indirectly using the measurement of the current flowing between dissimilar materials (usually Titanium and carbon steel). 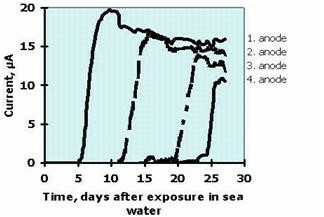 The advantage of corrosion monitoring is that the same points on the structure can be tested repeatedly over time and any changes noted and probes could be installed in inaccessible areas. On large structures the probes can be monitored by automated systems or manually at termination boxes. Innovative probes make use of the “ladder” or “rack” arrangement of carbon steel elements (known as anodes or WE’s) within the cover region of the concrete. As the region in which active corrosion is possible due to chlorides or carbonation (amongst many other chemicals) penetrate though the cover zone of the concrete the WE’s begin to corrode. As these are arranged at incremental depth the rate of chemical ingress into the concrete can be measured. From this advanced warning of the impending advance the onset of reinforcing corrosion can be predicted and durability models updated. One of the true strengths is that such numbers as the chloride threshold need not be considered as the direct corrosivity of the concrete is being measured on consumable materials (i.e. WE’s) with the same composition as the steel reinforcing. This idea of advanced warning is critical with regards to corrosion monitoring. Repair and maintenance strategies can therefore be determined using information routinely measured directly on the structure. Lower cost strategies can be deployed ahead of time and major repairs be prevented. Automatic corrosion monitoring system is designed to provide continuous and permanent monitoring of different probes/ sensors installed in structures distributed over hundreds of meters. Such system like Camur can retrieve and control data features collected from different sensors (ie. ERE20 Reference Electrode or Ladder system such as CorroWatch and CorroRisk etc) automatically through phone line, mobile phone or internet. The innovative Camur automatic corrosion monitoring system overcomes several important drawbacks of traditional monitoring system. The signal of Camur system is digitized close to sensors by placing a node nearby to reduce error and the Galvanic separation between analogue and digital circuitry prevents interference which is common through use of common ground on traditional monitoring system. On top of those, the Camur system use only a single bus cable running through all nodes (placed next to each sensor) to collect data and the cable ends at the Camur Controller which takes care of data storage, as well as communication with all nodes and with computer in the office. Manual monitoring of corrosion activity is often done by employing a termination box/ data-logging unit. An good example is the CorroZoa which is a data-logging Zero Ohm Ammeter designed to measure half-cell potential, corrosion current and temperature. The CorroZoa is connected to sensors by cables with data processed and stored in the termination box and the measuring results are transferred via USB. Half-cell potentials [HCP] are a very widely used technique which is inexpensive and easy to take in the field. The measurement process involves making an electrical connection to the reinforcing. To that lead we connect a voltmeter. From the other terminal of the voltmeter we connect a reference electrode (traditionally a Cu/CuSO4 or Ag/AgCl configuration). When the reference electrode is placed on the surface of the concrete with some moist foam at one end (providing electrical continuity) we form a rudimentary battery. The voltage measured will give the user an understanding or the likelihood of corrosion occurring. It will not give any measurement of whether corrosion is actually occurring or the rate. 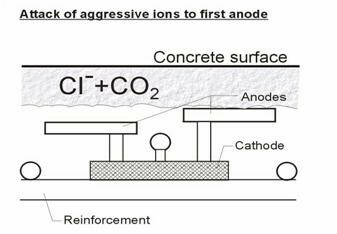 What needs to be understood at this point is what the reading taken represents, to do that we need to understand that when corrosion occurs in concrete we create a movement of electrodes through the steel from the anodic areas to the cathodic areas. Through the concrete we have a flow of hydroxide ions completing the circuit, this flow of current through the concrete creates an electrical field, which can be seen in a diagram as a series of voltage lines. When we measure the voltage from the surface of the concrete we are not measurement the voltage directly in the corroding anodic areas of steel; we are in fact measuring the strength of the electrical field present at the surface. The size and strength of the field at the surface is a function of the conductivity of the concrete (i.e. moisture and chloride levels) as well as the physical distance of the steel from the surface and whether corrosion is occurring. This phenomenon explains the variance of half-cell potential measurements with regards to ambient conditions, environment and the physical design of an element. With all of this in mind let us return to the traditional method for interpreting the half-cell potential reading. Ask many Engineers and the ASTM standard criteria would be easily re-iterated. This criteria indicates that a measurement of more negative than -350mV would indicate a 95% probability of corrosion. These criteria were produce empirically in the lab using marine type samples i.e. chloride rich and in a moist environment. It is therefore logical that these criteria should only be used in environments that match the ones used to create them as we already know that the presence of water and chlorides would mean that a higher strength of the field measured on the surface. Stronger statistical methods of determining structure specific criteria have been developed. These require the collection of a large number of results and treating the anodic and cathodic areas as two normal populations with their own mean and standard deviation. By doing this the ambient conditions can be disregarded and the structure analysed in any condition or time of the year. Equipment such as the CANIN+ allows for large areas to be surveyed quickly, providing the volume of data required for this technique. HCPs can be deployed onto a structure using a surface measurement or by installing permanent reference electrodes. As a surface measurement the results are generally collated in a grid pattern that covers the surface of the concrete, viewed as a kind of weather map showing the anodic and cathodic areas. 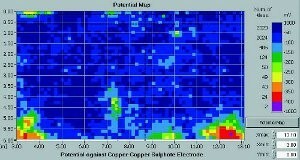 For a full corrosion investigation to take place the half-cell potential map is combined with visual inspection. A simple crack map overlaid on the HCP graph will generally identify which cracks are corrosion cracks and how far from the defect the steel is corroding.